From Marusan and Medicom Toy comes this Godzilla Vinyl Wars 1973 Overseas Version Sofubi Vinyl Figure - Previews Exclusive. 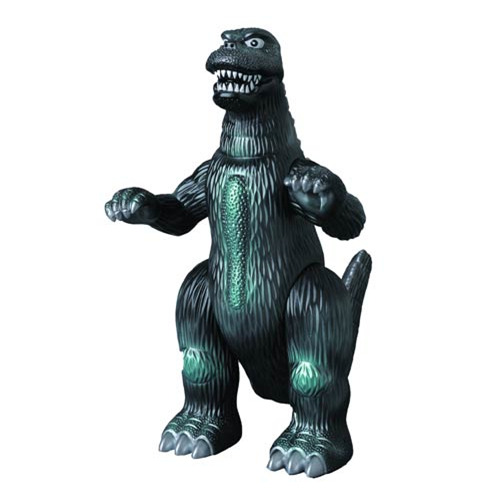 This Godzilla Vinyl Wars 1973 Overseas Version Sofubi Vinyl Figure - Previews Exclusive is hand-crafted, hand-painted. Marusan originally released the 9-inch tall 1973-75 and Megaro-Goji'in 2007. Since then, this style of sofubi has been oft-imitated, rarely matched. Originally bearing blue fins and red eyes, this re-issue has been specially painted with a more screen-accurate color palette of grey, green and white. Limited to an edition size to exceed 200 pieces, this Goji based on his appearance in Terror of Mechagodzilla is poised to thrill! Recommend for ages 15 & up.